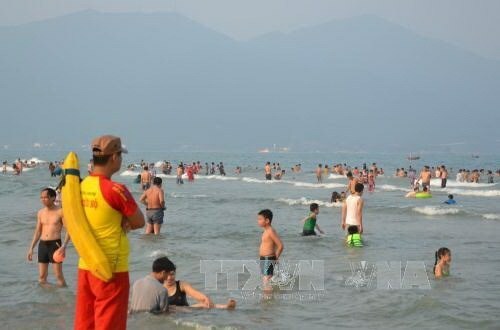 ​HCM City (VNA) - Travel firms have reported an increasing number of tour bookings for the upcoming three-day holiday for National Day, starting September 2, with beach trips receiving the highest number of bookings. Beach resorts at Da Nang, Nha Trang, Phan Thiet and Quy Nhon cities as well as Phu Quoc and Con Dao islands are popular among local and foreign tourists. Three-day sea tour packages for two people have sold well, including bookings to Da Nang-Hoi An, priced from 3.29 million VND (145 USD) per person; Quy Nhon-Hon Kho Island for 2.69 million VND (118 USD) per person; Ha Long Bay for 3.4 million VND (150 USD) per person; and Free & Easy tours to Phu Quoc Island for 5.65 million VND (250 USD) per person, according to Le Cong Nang of Hanoi-based Vietrantour. Tours to the Mekong Delta, including Can Tho-Chau Doc-Ha Tien and Can Tho-Bac Lieu-Soc Trang, and to Da Lat city in the Central Highlands are also popular. The number of bookings at Vietrantour rose by 5-10 percent during the summer compared to the same period last year, especially Free & Easy tours and combo tours for two people, Nang said. Nguyen Cong Hoan, deputy director of Hanoi Redtour, said sales of tours at his company grew 15 percent year-on-year this month and for the National Day holiday. Sea tour packages are mostly chosen by groups of families, with destinations in the northwest favoured by younger people, according to Hoan. The Saigontourist Travel Service Company is offering a wide range of summer promotions with nearly 40 budget domestic tours for departures between May and September. Cost-saving tours with destinations including Quy Nhon, Tuy Hoa and Da Lat, and five-day tours to the northwestern region and the six-day Northwest Region-Ha Long Bay tour are being offered. Two major bus stations in Ho Chi Minh City, Mien Tay (Western) Bus Station and Mien Dong (Eastern) Bus Station, railway stations and ferries will add more vehicles to meet the rising demand of commuters during the holiday. Kieu Nam Thanh, general director of Eastern Bus Station, said around 40,300 passengers would take short-distance trips to Vung Tau, Da Lat, Phan Thiet and Nha Trang cities on September 2. The station plans to add 100 buses during the holiday, but bus fares will remain unchanged during the period. Authorities at Western Bus Station said the number of commuters would rise 4-6 percent year-on-year to reach 54,000-56,000 passengers on September 2. Bus trips from HCM City to Can Tho city and the provinces of Tien Giang, Ben Tre and Ba Ria-Vung Tau will see a rising number of commuters. A total of 30 buses will be added to serve rising demand during the holiday. The Cat Lai Ferry Station announced that it would double the number of ferry trips to 280 during the holiday.